Momentum4 are a consultancy specialising in ‘People Performance’, taking individuals, teams and organisations through transformational change. With a proven track record, we work at a senior level with people who are passionate about the need to improve, evolve and continue to strive for ambitious goals. We enable choice and create possibility. Momentum4 has recently become the first UK Preferred Partner with Six Seconds, ‘The Emotional Intelligence Network’, where Momentum4 now embed their tools and methodologies to help support them delivering transformational change. Knowing others is intelligence; knowing yourself is true wisdom. Mastering others is strength; mastering yourself is true power. If you realise that you have enough, you are truly rich. 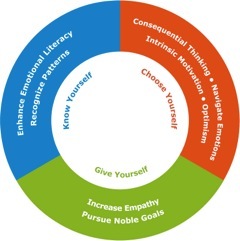 Emotional Intelligence (EI) refers to the collection of abilities used to identify, understand, control and assess the emotions of the self and others. As a Preferred Partner with Six Seconds, we apply their model and methodology to help support our clients in developing their EQ. In the world of sport, an athlete that is looking to win a medal at the Olympics, will ensure they have the right team around them to maximize their performance, one of the team being their coach. The coach will engage, challenge, support, empower, and give guidance to ensure success. More and more businesses are bringing in coaching to support their employees, so they too can improve performance, morale, motivate staff to achieve objectives, support them through change and give tools and techniques in handling difficult situations and or people. Coaching can also help new teams to reach peak performance quickly or help established teams to improve their effectiveness, or shape a cultural shift in organisations seeking to move to more responsive, committed, flexible, open ways of working. Most of the time, your emotional competence is sufficient to navigate the complexities of your daily work and life. However, in times of challenge, complexity, or stress, an increased EQ will strengthen your leadership. Why is Emotional Intelligence important to you as a leader? A leader’s job is to engage a team to do work beyond the capacity of any one individual. It is about enrolling people to utilise their full potential. When a leader is aware, authentic, passionate, and acts in integrity, s/he will build trust, commitment and alignment to foster an environment where people can bring their best to the table. There is no formula for great leadership, no magical path to follow. A great leader makes her or his own path – one that is uniquely based on his or her own skills and attributes. You cannot imitate someone else’s style or use a prescribed set of behaviours. Instead you need to carefully assess yourself to know your own strengths and vulnerabilities, and move forward. This SEI report will give insight to build and apply your EQ to improve leadership. By working with Momentum4, and using our simply and effective process, Engage – activate – Reflect, we can work with you to assess what is the right tool for us to engage with. Then, using the data, get a clear picture of what strengths you have and what areas need more focus for developing. Collaboratively, we can then, create a personal development plan. After a period of around 3-6 months, we can re-measure and look at outcomes. What has improved? What still needs work? What have you learnt by going through the process? At Momentum4 we believe that there are two key aims of managing performance. To enable people to build a personal resilience framework that is sustainable and keeps them closer to the optimal point in the performance curve. To apply the key coping strategies into a personal system of responsible management. At the optimum point on the curve we feel in control of our lives, energized, engaged and resilient. We can use our talents and abilities to their full potential. If demands are too high we become overwhelmed, mental energy drops, we feel we are struggling and we can become prone to a decline in performance. If demands are too low we feel disengaged, tired, demotivated…performance also drops. The advice given is specifically geared to enable people to consider small, practical, sustainable changes, that can make a big difference in terms of performance, effectiveness, wellbeing & health. This is achieved by creating robust ‘Coping Strategies’ that lock you in at the top. The advice given is specifically geared to enable participants to consider small, practical, sustainable changes that can make a big difference in terms of wellbeing, health, effectiveness and performance. This is achieved by creating robust ‘buffers’ that lock you in at the top. Don’t stop at best in class… become ‘World Class’. What are the key drivers and outcomes in business that create a ‘World Class’ team climate? Team engagement – According to Gallup, World Class teams have a different mix: 67% engaged, 26% neutral, and only 7% disengaged. Find out what your team mix is by working with us. Trust – Trust is a feeling of confidence, faith, and surety that engenders a willingness to risk and facilitate success in the other climate factors. Motivation – Motivation is the source of energy to overcome challenges, pursue a goal, or maintain commitment. Teamwork – Teamwork is collaborating to pursue a goal; it requires a sense of shared purpose and belonging. Execution – Execution is the ability to achieve strategic results by implementing effective tactics. Change – Change is the readiness to innovate and adapt to succeed in a continuously evolving situation. Agility – Does the team nimbly adapt to new opportunities and challenges? Satisfaction – Are the members committed to remaining in the team? Sustainability – Is the team creating enduring value, and can that continue over time? Using our simple and effective process of, Engage – Activate – Reflect, Momentum4 will work with you to measure the above drivers and outcomes for your team becoming ‘World Class’, ensuring your company objectives and purpose are always aligned. Using the data from the Team Vital Signs tool, (TVS) we will consult with you to create a personalised team development plan. This may include, team workshops, 1:1 coaching, team building activities and continual performance review and feedback fed by technology interventions. We will then schedule to re-measure the team with the TVS 3-6 months post interventions, to review and reflect on what’s working and what still needs improvement. Call us now to discuss further, please contact us. Employee engagement is essential for a successful, profitable and thriving business. For an employee to be engaged, there needs to be a few core things that are taken care of. Employees need to feel like they’re respected, that they’re part of the team, and that their ideas matter. Once that’s taken care of, they’ll be more likely to go above and beyond for their company and provide amazing service, come up with innovative ideas, and help the company grow. We know at Momentum4 just how important it is to engage in the right way, to get the best results. In business, research shows trends to what the top ten engagement essentials are, that if supported and developed will lead to a hugely engaged and successful organisation. They are…. We want to offer you the opportunity to experience, develop, engage with and sustain an ethos of having a robust employee engagement process across your organisation. We want to unite and inspire you to be the best supported team(s) in the business, to be world class. We do this by increasing individual performance, improving engagement inside the organisation, which will then make a positive difference to your bottom line results. We want to make an extraordinary difference to your teams across the business. We work within a high performing brand and we know and understand pressure and how to manage and work with pressure to turn it into positive energy. Understanding the ‘Weird and Wonderful World’ of others! Treat others as they want to be treated! Understanding ourselves is always a good place to start. This is the foundation of emotional intelligence. Once we have greater self awareness, we can then start to really notice the differences in others. Why is this so important? By recognising people are ‘different’ and not always ‘difficult’, we can see others perspectives and view of the world! What are some of those differences? Filters – our brains filter, delete, distort and compare information based on what’s important to us and going on in our own world! In our experience working in many different organisations, we find that certain unacceptable behaviours are left un dealt with. This can create a culture where potential bullying occurs and people who demonstrate these unwelcome ways of working contradict the values and mission of the business. Managers avoid these difficult situations and therefore allow the behaviours to continue to be the norm. Reasons why this may happen may include, fear of conflict, not having the skill set to deal with such people and situations and maybe a lack of confidence and uncertainty. Another major factor to consider is how the trust levels are within the teams across the business. Is there a lack of trust, causing there to be a ‘blame culture’, where people don’t take any responsibility because they don’t think it’s their job to. Therefore, blaming another person or department. To build trust, people need to know what other areas of the business do and how that links into what they do. Clear communication top down is essential across the whole business to ensure employees are bought into the company mission, purpose and values. This is a critical step in bringing teams together who can then work in a positive and assertive way. This also means that people have permission to have difficult conversations because the relationships have been built and people fully understand, consequences and actions that need to be taken to ensure the business is performing at its best. Transactional Analysys model – Types of ego states and impact! Passive/aggressive behaviour! The influences on communications model – It’s not what you say, it’s HOW you say it! Our intervention will be highly interactive, high energy and fun with the main focus on coming together as a group, achieving results and taking responsibility for outcomes.